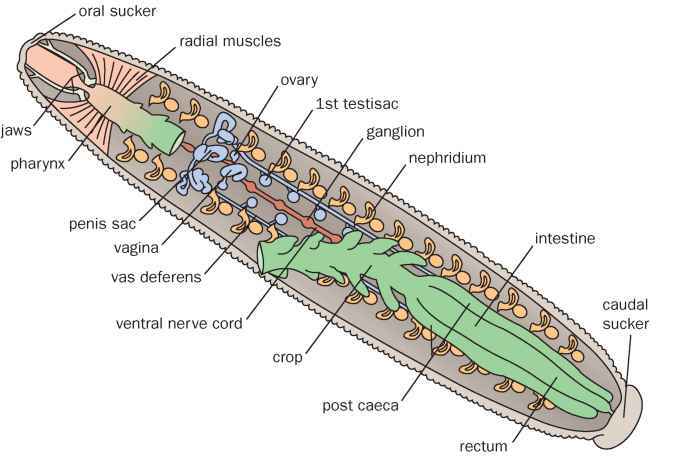 the basic unit of transcriptional control in bacteria. Despite the fact that, at the time, no methods were available for determining nucleotide sequences, Jacob and Monod deduced the structure of the operon genetically by analyzing the interactions of mutations that interfered with the normal regulation of lactose metabolism. We will examine the effects of some of these mutations after seeing how the lac operon regulates lactose metabolism. Lactose (a disaccharide) is one of the major carbohydrates found in milk; it can be metabolized by E. coli bacteria that reside in the gut of mammals. Lactose does not easily diffuse across the E. coli cell membrane and must be actively transported into the cell by the enzyme permease (< Figure 16.6). 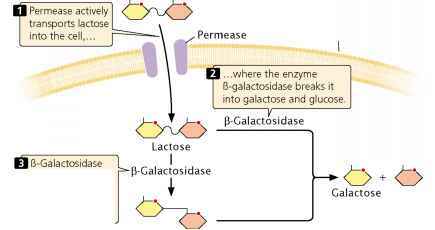 To utilize lactose as an energy source, E. coli must first break it into glucose and galactose, a reaction catalyzed by the enzyme p-galactosidase. This enzyme can also convert lactose into allolactose, a compound that plays an important role in regulating lactose metabolism. A third enzyme, thiogalactoside transacetylase, also is produced by the lac operon, but its function in lactose metabolism is not yet known.